"The life of the world to come" are the last words of the Christian prayer the Nicene Creed, just before the standard obligatory "Amen," let it be done. 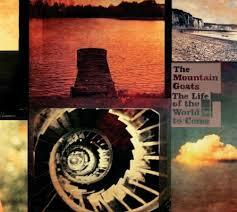 Indie-rock outfit The Mountain Goats have borrowed the phrase for their latest full-length, an album that leans upon religious allusion and spiritual identity. While simultaneously writing the album and dealing with the aftermath of a death, The Mountain Goats' John Darnielle performed his own biblical exegesis, using the sacred religious text as a pillar on which to support the heavy themes of his 17th album. The songs themselves, some peppered with actual Bible verse, take the names of the passages they've been inspired by, which will no doubt have his rabid cult Googling "Hebrews 11:40" like eager Sunday school kids. The Life of the World to Come largely features acoustic guitar-piano jams, fixing in some string arrangements care of Final Fantasy's Owen Pallett. Though somewhat of a departure from his typical colorful cast of characters, the Goats' current incarnation maintains a mystical feel similar to that of last year's Heretic Pride. An allusion to Eden, "Genesis 3:23" revisits the old "you can't go home again" adage; instead of rising and falling on each refrain, a breezy Darnielle just mentions, "I used to live here." The Goats get jazzy and syncopated on "Philippians 3:20-21" and fervent with fiery conviction on "Psalm 40:2." There are portions of the album-namely the uptempo numbers-that verge too close to the non-threatening, WOW-pop being fashioned in today's superdome churches. On "Romans 10:9," the cheery optimism of lines like, "Believe in your heart/ and confess with your lips" are well-intentioned yet feel didactic and derived from Born-Again chic. Fortunately, introspective piano-driven tunes "Genesis 30:3" and "1 John 4:16" soften the edges. The Life of the World to Come isn't exactly a head-nodding compendium to the Good Book as much as a shoulder-shrugging desire for surrender. For some, an album with such strong religious overtones may distance those disenchanted with the church. The concept is no doubt a risky one, bringing together the holy and the secular. But it's honest. And like Darnielle's other quasi-autobiographical works, The Life of the World to Come reflects suffering and the human condition through his own coping mechanisms.